After his fantastic book “Enjoy The Game”, Lionel Birnie is coming back with a new book “The 100 Greatest Wins” which runs down the Top 100 post-war Watford wins. For more information look at his website. And this week Lionel writes about an object that is is synonymous with one of those historic wins. 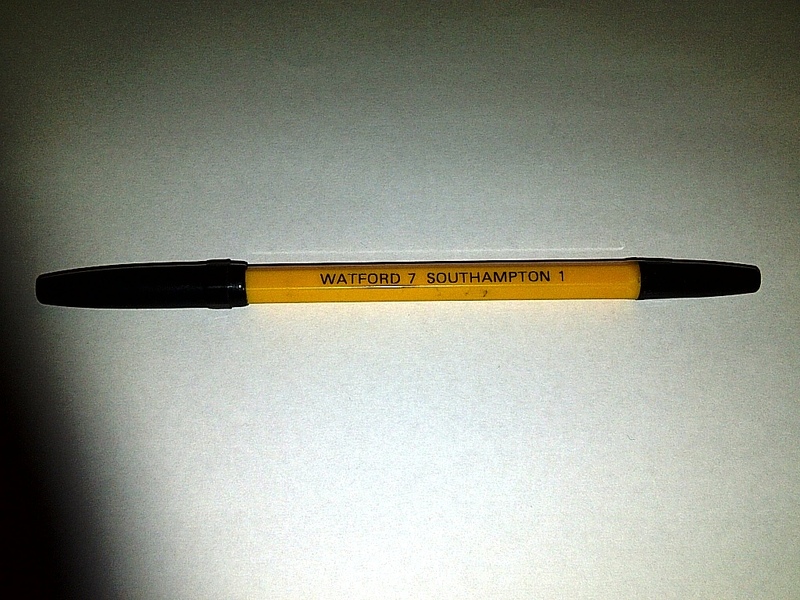 My search for a Watford 7 Southampton 1 commemorative pen goes on. The quest has been so long and so fruitless I am beginning to doubt they even existed. I was not at that barmy game on a balmy early September evening in 1980. It was way past my bedtime and Watford FC featured only briefly at the edges of my life. I was still a couple of years or so away from full-on addiction. But back to the point of the pen. As any Hornets fan knows, Watford lost 4-0 to First Division Southampton in the first leg of a League Cup tie at The Dell. (For those under the age of about 20, a small glossary of terms. First Division = Premier League. League Cup = Carling Cup. The Dell = St Mary’s Stadium. Sadly the idea of a 4-0 defeat at Southampton is something we are all too familiar with this week). Improbably, Watford won the second leg 7-1. If you were at the match, you won’t need reminding of the details. If you weren’t, check out my forthcoming book, The 100 Greatest Watford Wins. It’s in there. Probably. Shameless plug over. How did Watford FC’s marketing department choose to celebrate this monumental result? That’s right, they got on the phone and ordered a batch of pens bearing the score. Pens. Truly, the early 1980s were a more innocent time. What would it be these days? An App, probably. Something flashy and gizmo-y that appeals to our shrinking attention spans. With just the right combination of flashy graphics to be fleetingly attractive yet instantly forgettable. But a pen. Who wouldn’t want a commemorative pen? As I slowly immersed myself in all things Watford FC in the early 1980s, I read voraciously. Programmes, yearbooks, newspapers, Match magazine. I learned quickly but, in contrast to today, not at my own pace. Information was not flying at you from all angles. You had to work at it. These days, you can get on the internet and find out who won the 1972 League Cup immediately. (It was Stoke City). Back then, you had to buy a book, or wait for a magazine to print a roll of honour. Ridiculous. So there were great gaps in the young football fan’s knowledge. Our understanding of past football seasons you hadn’t witnessed was only partially complete. So, in 1982, when I got my hands on a copy of the 1981 Watford FC annual handbook, I scanned the results, soaking up the information, and can still remember the double-take as I saw the score of that match. 7-1. Must be a misprint, so I checked with my dad. 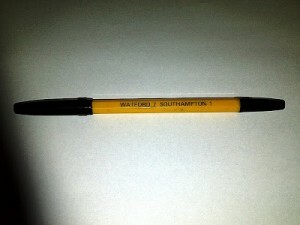 Then I bought a bundle of Watford programmes from late 1980 at a car boot sale and saw adverts for the commemorative pen. Not only was the result real, they made a pen? Dad didn’t have one. He’s brought with him a shoulder bag that looks like a girl’s satchel. And a pencil case. Loser. This guy’s just graduated from university and he still has a pencil case? And then he pulls out a pen. I see the seven and the one on the lettering first. I can feel myself hold my breath. If I had one of those pens, I think to myself, I’d keep it in a decorative stone sarcophagus. This wally is willing to risk it rubbing against other ‘ordinary’ pens in an unpadded pencil case? He explains that the centre bit, the ball point and the ink, has been replaced several times over the years with those from regular un-seven-one pens but that does nothing to lessen my desire to have it. For the rest of the week, I think about pinching it but simply cannot go through with it. How would it work? I can see the chain of events. The moment he realises it’s missing. My cheeks flush red. My unconvincing attempt to say “Er, no mate, I’ve not seen it.” The pen falling out of my pocket and lying at my feet. My pathetic claims of innocence. “I’ve no idea how it got in my pocket, honestly.” The police being called. Hours of nice cop, nasty cope under the glare of a harsh anglepoise lamp. A tearful confession. The humiliation of telling my family I’m a thief. The court case and inevitable prison sentence. 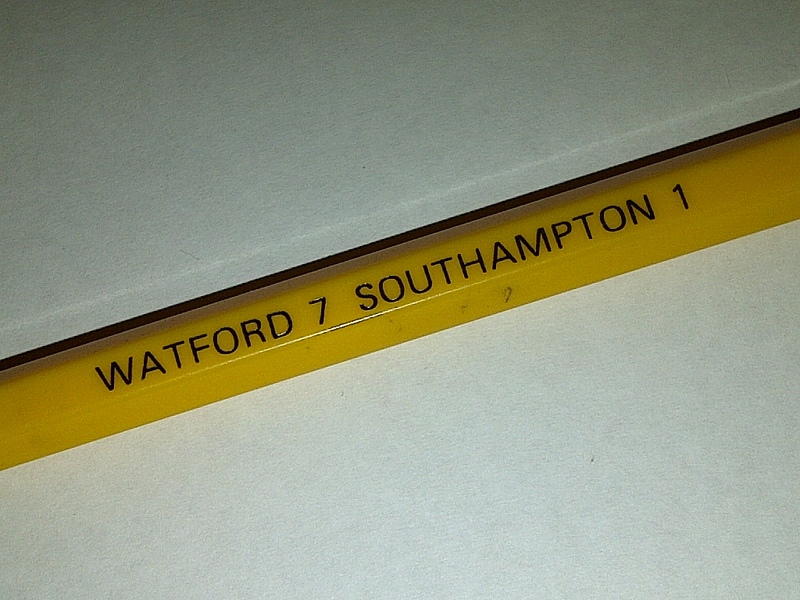 Years later, eBay came along and although I’ve bought all manner of Watford-related nonsense at stupidly inflated prices, I’ve never come across a 7-1 pen. Not so much as had the chance to bid up to £50.01 for it. Where are they all? Anniversaries have come and gone and the club’s marketing department has inexplicably failed to produce a replica. How about a range of ‘epic scoreline pens’. Watford 8 Sunderland 0. Watford 3 Kaiserslautern 0. Luton Town 0 Watford 4? No, no, no. Stop it. You’ll ruin it. You can’t just issue a pen willy-nilly every time Watford thrash someone. And so the search goes on. Someone out there must have a Watford 7 Southampton 1 pen. And if you do, can I just borrow it for a sec? I’ll give it back. I promise.